Philosophy Group, Wageningen University, The Netherlands. In January 2018, it will be two hundred years ago that Mary Shelley’s gothic novel Frankenstein; or the Modern Prometheus was first published. However, international commemorations have already started and the so-called Frankenstein Bicentennial Project has been launched by Arizona State University. Instead of awaiting the bicentenary of the first publication, meetings have been organized to celebrate the famous occasion on which the idea of the novel was first conceived by Mary Shelley (then still Mary Godwin). That was during a memorable nightmare in the early hours of June 16, 1816, while she was staying in a villa on the shores of Lake Geneva. In mid-June 2016, therefore, an international workshop entitled ‘Frankenstein’s Shadow’ was held in Geneva to commemorate this event and to determine the contemporary relevance of Mary’s novel for understanding and assessing new developments in the modern life sciences. After all, in many contemporary debates references to her horror story are still routinely being made. Genetically modified crops, for instance, are often condemned as ‘Frankenfoods’ and life science researchers are frequently accused of hubris or attempting to play God, just as Mary’s protagonist Victor Frankenstein supposedly did. Indeed, the mere mentioning of his name readily brings to mind such associations among laypersons, or as Marilyn Butler writes, “Readers, filmgoers, people who are neither, take the very word Frankenstein to convey an awful warning: don’t usurp God’s prerogative in the Creation-game, or don’t get too clever with technology” (Butler 1993: 302). The circumstances in which Mary first conceived the idea of her novel may help to illuminate the significance and meaning of her literary creation. In the late spring of 1816 a remarkable entourage, next to Mary Godwin, assembled on the shores of Lake Geneva: the romantic poets Lord Byron and Percy Shelley (Mary’s lover and later husband), Mary’s step-sister Claire and doctor John William Polidori. The then 28-year-old Byron was the oldest of the company; Mary was still only 18, but had already lost her first child as an unmarried teenage mother. It was a time, just after Napoleon’s defeat, that British citizens could again freely travel through Europe. Each of the participants had their own reasons to flee from the United Kingdom. Byron was haunted by creditors and scandals. Percy Shelley had abandoned his wife and child and made himself unpopular through his overt atheism. Claire had persuaded Percy and Mary to follow Byron in his travels, because she had a crush on the noble poet (her attempt to win his love would however be in vain). Young doctor Polidori had been recruited by Byron to be his travel companion and private physician, but also cherished literary ambitions himself (in 1819 Polidori would publish The Vampyre: A Tale, another product of the Geneva 1816 summer and a source of inspiration for Bram Stoker’s Dracula). The choice of Geneva as the place to stay had been partly inspired by Jean-Jacques Rousseau, the proud “citizen of Geneva”. 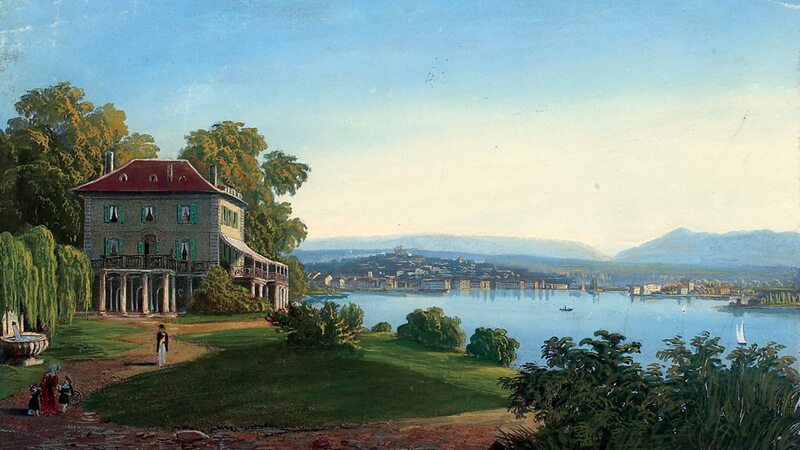 In the footsteps of their romantic precursor, Byron and Percy Shelley wanted to experience the majestic sublimity of the natural landscape around Geneva. In the nearby hamlet of Cologny, Byron had rented a spacious residence, Villa Diodati; Percy and Mary stayed with Claire at a more modest dwelling in the neighbourhood, but regularly visited Byron to spend days and evenings at his villa. Figure 1. Villa Diodati on the shores of Lake Geneva. Painted by Jean Dubois. Image extracted from Wikimedia Commons. It appeared as if the summer of 1816 did not want to become a real summer. In the introduction to the revised 1831 edition of her novel, Mary looked back: “But it proved a wet, ungenial summer, and incessant rain often confined us for days to the house.” (Shelley, 2003 : 6–7). Incidentally, this was not a purely local weather condition. In North America, the year 1816 would even go down in history as “the year without summer”. We know now that these meteorological abnormalities had to do with the most violent volcanic eruption of the last one thousand years, to wit, the eruption of the Tambora on the Indonesian island of Sumbawa in April 1815. The enormous amounts of volcanic ash spread throughout the earthly atmosphere massively reflected sunlight and disturbed global weather processes for three years in a row (D’Arcy Wood, 2014). Figure 2. 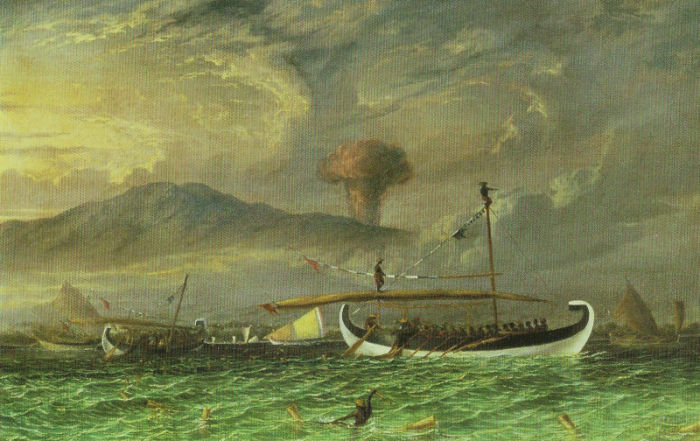 Possible depiction of the eruption of Mount Tambora on Sumbawa in 1815. Author unknown; image extracted from Scientific American Blog Network (2012). Figure 3. The ‘Monster’; frontispiece of the revised 1831 edition of Frankenstein. Theodor von Holst (1831); image extracted and modified from Wikimedia Commons. So Mary finally had her ghost story. On Percy’s instigation, she would elaborate and rework the story during the following months and years into a full-fledged novel. On the precise way the “thing” was brought to life, the book remains understandably somewhat vague. But there is a strong suggestion that electricity played an indispensable role in infusing the spark of life into the lifeless thing. In the 1831 introduction Mary referred to so-called ‘galvanism’, which enjoyed much interest at the time. At the beginning of the 19th century several sensational experiments had been made before public audiences with the newly developed Voltaic battery, showing that electric currents could be used to arouse muscular contractions and thereby to call forth motions of the body parts of dead animals or even human cadavers. It seemed as if those body parts could be “reanimated” in this way. In one notorious demonstration performed in 1803 before a London audience, Galvani’s nephew Giovanni Aldini administered an electric current to the face of a freshly executed murderer, whereupon “the jaw of the deceased criminal began to quiver, and the adjoining muscles were horribly contorted, and one eye was actually opened” (London Morning Post, January 1803, quoted in Lederer, 2002: 14). It was not too far-fetched, therefore, to think that the mysterious principle of life had something to do with electricity. At any rate, electricity in the guise of lightning plays a major role in the depiction of the ambient atmosphere of the novel. Thus, after receiving the news about the death of his younger brother, Victor Frankenstein witnessed a ”beautiful yet terrific” thunderstorm spectacle with dazzling flashes of lightning going to and fro above the Alps, the Jura and Lake Geneva (Shelley, 2003 : 77). The electrically charged atmosphere provided a fitting background to the vicissitudes in which Frankenstein and his creature got embroiled. Mary had derived this element of the novel from the exceptional weather conditions she actually experienced in Geneva. As she wrote in a letter to her half-sister in England: “The thunder storms that visit us are grander and more terrific than I have ever seen before” (Mary’s letter to her half-sister Fanny Imlay, dated 1 June 1816; see Shelley, 1993 : 174). Figure 4. 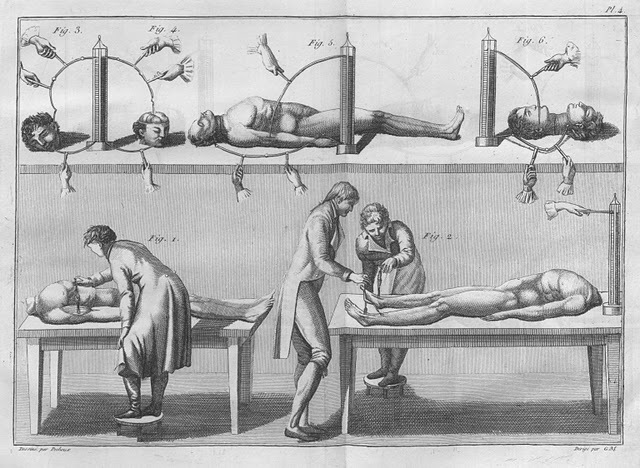 ‘Galvanic’ experiments on executed criminals performed by Dr. Giovanni Aldini (1804). Image extracted from Wikimedia Commons. It is not difficult to associate electricity with fire through lightning and heavenly fire. In the title of her novel Mary alluded to the Greek myth about Prometheus, the Titan who had stolen fire from the gods to give it to humankind and who was severely punished for this act. Similarly, Victor Frankenstein brought disaster upon himself and his loved ones by indulging in the “unhallowed arts” of “bestowing animation upon lifeless matter” and by creating a human-like being. He aspired “to become greater than his nature [would] allow” (Shelley, 2003 : 54), or in other words, to play God. For Byron and Percy, however, Prometheus was also the iconic rebel hero who dared to defy the existing divine order in the name of promoting human happiness. In their eyes this endeavour should not even stop short of attempting to overcome death. Mary was apparently less enamoured by the Greek demigod celebrated by her romantic companions and was acutely aware of the possible downsides of “Promethean” ambitions. Or at least she was more ambivalent. As the biographer and historian Richard Holmes noted, the romantic generation of the Age of Wonder (1770–1830) had to discover both “the beauty and terror of science” (Holmes, 2009). Mary portrayed Victor Frankenstein as an investigator who is so much obsessed by his research project that he completely neglects his social obligations vis-à-vis his family, his friends and his fiancée. For her, the outstanding example of a passionately obsessed researcher was the English chemist Humphry Davy, whose main achievements were in the domain of electrochemistry (another connection with electricity and ‘galvanism’!). In the first decade of the 19th century, Davy isolated new chemical elements like sodium and potassium with the help of the Voltaic battery. In his public lectures he also sketched an enticing prospect of the endless possibilities of chemical research that would bestow on man “powers which may be almost called creative” (Davy, 1802: 319). From reading these lectures Mary had concluded that scientists might at times be driven by a truly obsessive preoccupation. 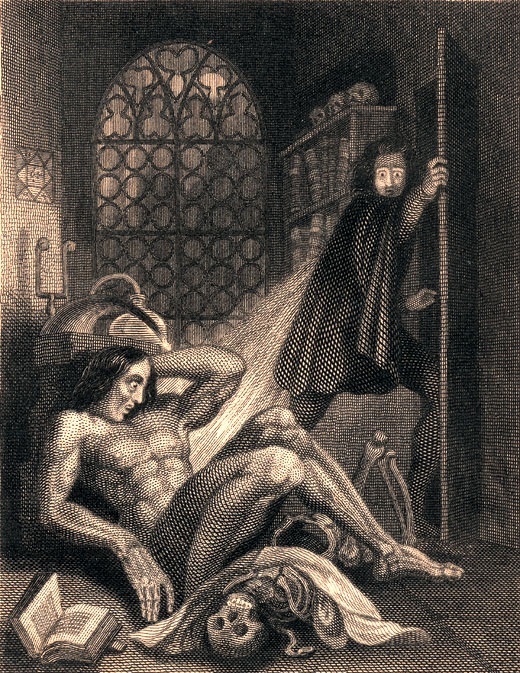 In this respect, Davy set the example for Victor Frankenstein: “So much has been done […] – more, far more, will I achieve: treading in the steps already marked, I will pioneer a new way, explore unknown powers, and unfold to the world the deepest mysteries of creation” (Shelley, 2003 : 49) ‒ this was how Victor Frankenstein described his new ambition after a university professor had pointed out the virtually unlimited possibilities of modern chemistry to him. Figure 5. Humphry Davy isolated sodium and potassium by using the Voltaic battery. Magazine engraving (19th century), colored; image extracted from fineartamerica. For some commentators, Frankenstein’s moral transgression was not that he undertook the over-ambitious or hubristic attempt to bestow life on inanimate matter and thereby usurped the divine privilege. He must rather be blamed for the fact that, once his work finally met with success, he immediately ran away from “his odious handy-work”. He thereby left his creature, which he himself had brought into the world, to its own fate – devoid of any parental care. The middle part of the novel, which follows the creature’s life and vicissitudes, is a morality tale in its own right. From the outset, contrary to the portrayals in most movie versions, the creature is not a ruthless monster. It wants to do good and needs the company of fellow beings and their affection and recognition. However, the saying that when you do good, good things will happen to you did not apply to the creature. Due to its hideous appearance, it repeatedly met with rejection. Its attempt to remind Frankenstein of his parental duties was also to no avail. Only as a result of all these hostile responses did the creature become a monster, intent on revenging the injustices done to it with acts of violence. In an early review of the novel, Percy Shelley summarized the simple moral lesson thus: “Treat a person ill, and he will become wicked.” (Percy Shelley, 1993: 186). Seen in this light, Frankenstein’s greatest moral shortcoming was that he failed to assume responsibility for his own creature and to give it the care that it needed and deserved. Figure 6. Another reading of the Frankenstein tale. Image extracted from Wikimedia Commons. Gould’s flat denial that the themes of hubris in emulating God and transgression against a natural and divine order are nowhere to be found in Mary Shelley’s account is quite astonishing. Traditionally, for many readers her novel is precisely also about these themes: they are by no means a later invention of Hollywood adaptations. Mary’s introduction to the 1831 edition directly contradicts Gould’s denial (see the passage quoted above). Thus the Dutch literary critic Pieter Steinz, for one, reaffirmed the traditional reading of Frankenstein: “The moral is clear, and it is more relevant than ever in the 21st century, which is dominated by the advancing genetic and bio-technologies: do not play God and beware of the dangers of technology” (Steinz 2002). ―Halpern et al., 2016: 4, 6. 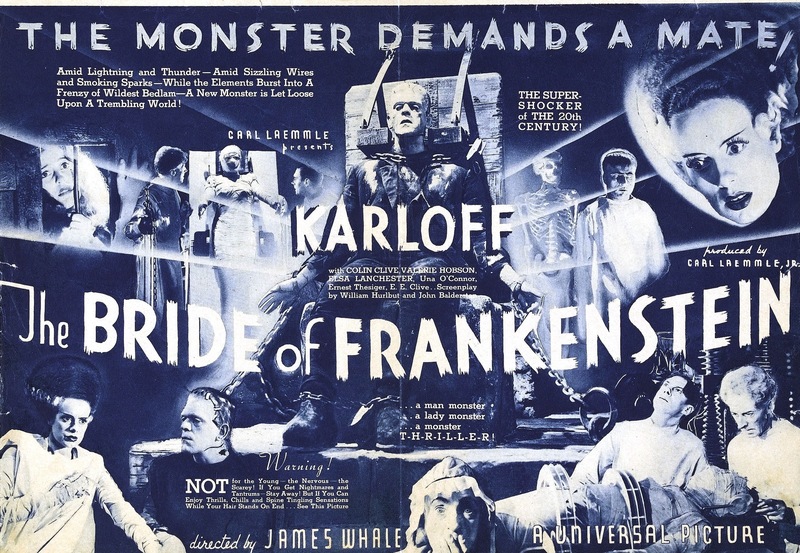 Although the authors admit that they read the Frankenstein novel “against the grain of many popular interpretations, which see it as a story about the abominations created when man decides to play God” (ibid., 4), they do not explain why they deem the common understanding incorrect as an interpretation of Mary Shelley’s story. However, the protagonists of the Frankenstein Bicentennial Project may have good reasons for considering invocations of hubris and playing God “unhelpful tropes” for their own agenda of promoting responsible innovation, as these tropes tend to deny that “the human actors are responsible for their own decisions and for what they do with the fire of creativity” (ibid., 7). Indeed, one may readily admit that the standard objection of ‘playing God’, routinely raised against new developments in the modern life sciences, has been reduced to a facile journalistic cliché or an alarmist slogan, as I have argued myself in an earlier article (van den Belt, 2009). Still, this does not justify treating these themes as completely foreign to a proper understanding of Shelley’s gothic novel, the more so, as the latter’s use of the expression “unhallowed arts” clearly suggests that the very attempt to bestow life on lifeless matter may indeed be seen as “ungodly”. The real interpretative challenge is to explain how the two different readings of the novel (hubris and playing God versus Frankenstein’s moral failure to take care of his creature) can be reconciled, for there surely exists a tension between them. If the goal is to promote responsible (research and) innovation – the underlying agenda of the Frankenstein Bicentennial Project ‒ , it also will not do to declare public fears about hubris and playing God simply out of court. After all, an important part of the new agenda is to take public concerns about new technological developments seriously and to somehow address them in the further course of the innovation process. The general public may also be concerned, and rightly so, about the “Promethean” or “hubristic” projects often being contemplated by contemporary life scientists. However much people nowadays may admire their creativity and imagination, as Mary Shelley and her contemporaries did in an earlier age, they will also feel overwhelmed when the flights of the biotechnological imagination become a little too audacious. As Richard Holmes argues, it was Shelley’s romantic generation which first had to face the beauty and terror of science (Holmes, 2009). It seems that we are still their cultural heirs. Thus the emphatic assertion that “[t]he lack of care for new creations is what ultimately destroys us, not the creations themselves” is rather unfortunate in that it arbitrarily restricts the scope of meaningful social debate. It suggests that the public should refrain from discussing the desirability of the many new “creations” technoscientists are about to bring into the world and only see to it that proper care is offered afterward once they have been introduced. If we think about some of the wild ideas that currently circulate among synthetic biologists (e.g., proposals to resurrect the woolly mammoth or Neanderthal man and schemes for “gene drives” or for changing the nucleotide ‘letters’ of the DNA alphabet), it immediately transpires that this is too narrow a view. Indeed, synthetic biologists and other life science researchers often set such bold targets that the audacity of the biotechnological imagination constitutes the contemporary equivalent of what was traditionally called hubris. Of course, their scientific and technological aims should not simply be rejected out of hand, but deserve to be seriously discussed – a discussion that might nonetheless be properly informed by cautionary tales about “Promethean” ambitions like Mary Shelley’s Frankenstein story. A final critical point about the interpretation endorsed by the Frankenstein Bicentennial Project is that their notion of responsibility vis-à-vis new technologies is largely modelled on the idea of care – the care Victor Frankenstein failed to bestow on his creature. Now we know fairly well what care means as long as we are talking about parental care towards children. So the creation of an artificial human being would presumably entail taking (parental) care for the new creature, however hideous it may look. But it is far less clear what the idea of care involves when we are talking about the creation of non-human life-forms; and even less so when talking about inanimate technologies. Bruno Latour’s call to “care for our technologies as we do for our children” (Latour, 2012) is simply begging the question. In sum, a proposed ethics of care for responsible innovation sounds nice, but also remains somewhat vague. Figure 7. The monster demands a mate! Poster for the movie Bride of Frankenstein (Universal Pictures, 1935). Image extracted from Wikimedia Commons. Incidentally, this whole reasoning is of course predicated on the assumption that the artificial creature was not a member of the human species. From the very outset, its taxonomic status had been somewhat ambiguous. While Frankenstein’s intention had indeed been to create an artificial human being (Shelley, 2003 : 54), his initial speculations were also focused on creating a new species: “A new species would bless me as its creator and source; many happy and excellent natures would owe their being to me. No father could claim the gratitude of his child so completely as I should deserve theirs” (ibid., 55). It is safe to conclude that the human status of the artificial creature has been problematic from the start. 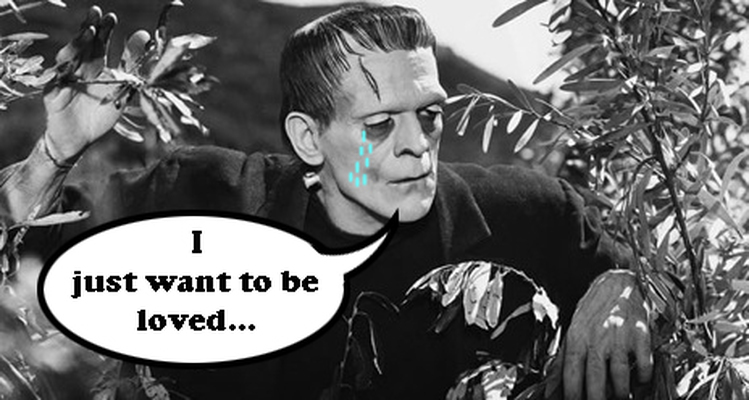 From the viewpoint of an ethics of care one could argue that Frankenstein should have complied with the creature’s demand to have a female companion created for it, given his parental duty to assure its happiness and wellbeing and given that the creature after many attempts had failed to acquire a recognized place in human society. On the other hand, it cannot be denied that there is also ethical merit in Frankenstein’s decision to decline the creature’s wish. At the very least, then, the whole episode could be an interesting test case for probing our moral intuitions about what would be truly responsible action in the given situation. 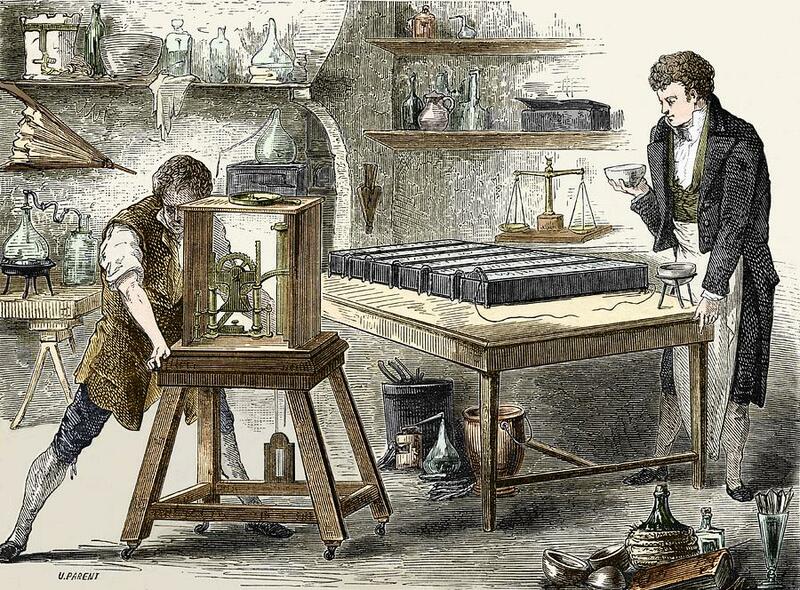 Two researchers recently formalized Victor Frankenstein’s reasoning by setting up mathematical models of species interaction, in particular modelling situations of “competitive exclusion” between two species. They conclude that “[Frankenstein’s] rationale for denying a mate to his male creation has empirical justification” and that “the central horror and genius of Mary Shelley’s novel lie in its early mastery of foundational concepts of ecology and evolution” (Dominy & Yeakel, 2016). This is a rather surprising new reading of the novel. We may finally wonder why the proponents of responsible innovation have passed in silence over the entire episode of the novel. Perhaps it is because a (presumably) responsible decision not to create a new entity would not fit their presumption that is not the “new creations themselves”, but only our own lack of care for them that can bring us down. Butler, M. (1993) Frankenstein and Radical Science. In: Hunter, J.P. (Ed.) Frankenstein. A Norton Critical Edition. Norton, New York. Pp. 302– 313. D’Arcy Wood, G. (2014) Tambora: The Eruption that Changed the World. Princeton University Press, Princeton. Davy, H. (1802) A Discours introductory to a Course of Lectures on Chemistry, Delivered in the Theatre of the Royal Institution, on the 21st of January, 1802. In: Davy, J. (Ed.) The Collected Works of Sir Humphry Davy. Smith, Elder and Co., London. 1839, II. Pp. 307–326. Dominy, N.J. & Yeakel, J.D. (2016) Frankenstein and the Horrors of Competitive Exclusion. BioScience, October 28, 2016. Gould, S.J. (1996) The monster’s human nature. In: Gould, S.J. (Ed.) Dinosaur in a Haystack. Cape, London. Pp. 53–62. Halpern, M.K. ; Sadowski, J.; Eschrich, J.; Finn, E.; Guston, D.H. (2016) Stitching together creativity and responsibility: interpreting Frankenstein across disciplines. Bulletin of Science, Technology & Society 2016: 1–9. Holmes, R. (2009) The Age of Wonder: How the romantic generation discovered the beauty and terror of science. Harper Press, London. Isaacs, L. (1987) Creation and Responsibility in Science: Some Lessons from the Modern Prometheus. In: Isaacs, L. (Ed.) Creativity and the Imagination: Case Studies from the Classical Age to the Twentieth Century. University of Delaware Press, Newark. Pp. 59–104. Latour, B. (2012) Love your monsters: why we must care for our technologies as we do for our children. The Breakthrough, Winter 2012. Lederer, S.E. (2002) Frankenstein: Penetrating the Secrets of Nature. Rutgers University Press, New Brunswick. Shelley, M. (1993 ) Letter to [?Fanny Imlay]. In: Hunter, J.P. (Ed.) Frankenstein. A Norton Critical Edition. Norton, New York. Pp. 173–175. Shelley, M. (2003 ) Frankenstein or The Modern Prometheus. Penguin Books, London. Shelley, P. (1993 ) On Frankenstein. In: Hunter, J.P. (Ed.) Frankenstein. A Norton Critical Edition. Norton, New York. Pp. 185–186. Steinz, P. (2002) Mrs. Frankenstein. NRC Handelsblad, June 8, 2002. Threapleton, M.M. (1963) Introduction. In: Shelley, M., Frankenstein; or, The Modern Prometheus. Airmont Books, New York. Pp. 3–7. van den Belt, H. (2009) Playing God in Frankenstein’s footsteps: synthetic biology and the meaning of life. Nanoethics 3: 257–268. Winner, L. (1977) Autonomous Technology: Technics-out-of-Control as a Theme in Political Thought. The MIT Press, Cambridge.